Xbox One, the latest series of gaming console developed by Microsoft has created a new record in the Xbox history: Over 1 million units were sold within 24 hours of its launch on November 22, 2013. Xbox is an iconic gaming console series, which was first introduced in the year 2001 by Microsoft. The inventor of this console was Atari Jaguar, which ceased production in 1996 after selling 24 million units. In the year 2005, Microsoft introduced Xbox 360 which has sold more than 77 million units as of April, 2013. The successor to Xbox 360 is Xbox One, which has broken all previous Xbox records by selling more a million units in the first 24 hours. Fans from all over the world lined up at Microsoft Store since midnight in order to become the first one to grab a unit; a scene rarely seen with Microsoft product launches and more or less associated with Apple launches. But when it comes to Xbox series, then it has some serious fan following. Xbox One was simultaneously launched in 13 countries, including UK, and this marked the biggest ever launch of this gaming console series. 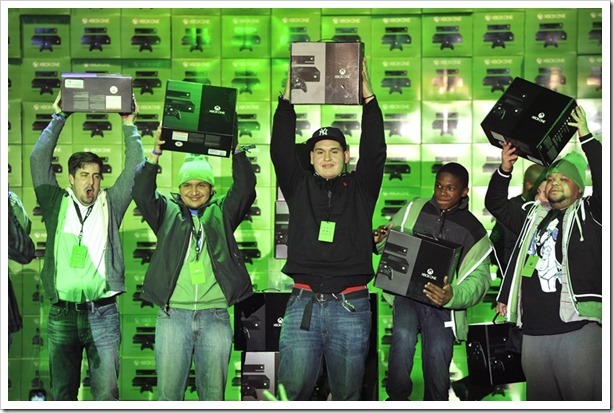 In several countries, twice as many Xbox One units were sold compared to Xbox 360 which was launched 8 years ago. Clearly the fan following of Microsoft’s gaming series has increased by leaps and bounds in all these years. Here are the top rated games for Xbox One series, updated as per the current ratings of players. Xbox One costs $500 for one unit, and includes not only games but also Kinect integration, Voice commands, Video conferencing, Blu-Ray and other media functions. As soon as the console was launched globally, complains started arriving that the units are not working properly. Maximum issues came from the defect in Blu-Ray drives, as users complained that their drives are not working. Some of the fans reported that there is a strange grinding sound coming in from these drives, which is making the overall experience bad. In some cases, there was a complete hardware failure as the machine stopped functioning. But overall, Xbox One is a bumper hit, all over the world. Retailers have declared that their stocks were finished within hours, and SOS has been sent to Microsoft’s headquarters to deliver more units, as there is ‘unprecedented’ demand for this latest gaming console. If you are a game lover, then what are your views on this latest offering from Microsoft? Will you rate it higher than Playstation 4 which was also launched last week, and which also managed to sell one million units in 24 hours? Please do share your views! Google Patents Idea For Automated Social Media Management; Will It Work?